Insta Profit Hack review - SCAM? 4 UGLY TRUTHS about IG Profit Hack! 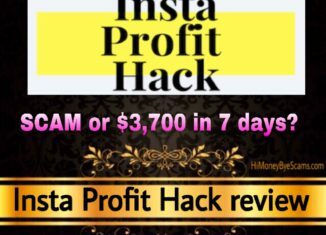 Home > Online opportunities > Insta Profit Hack review – SCAM? 4 UGLY TRUTHS about IG Profit Hack! Insta Profit Hack review – SCAM? 4 UGLY TRUTHS about IG Profit Hack! Welcome to my Insta Profit Hack review (also called IG Profit Hack)! 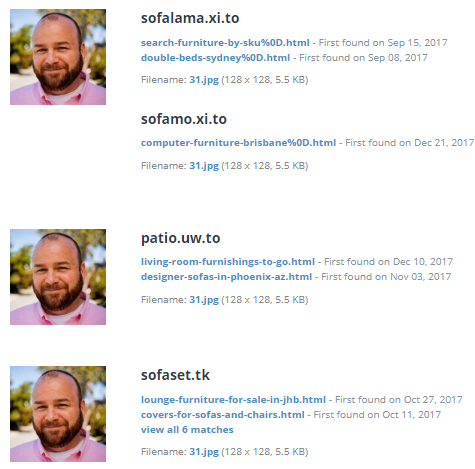 Have you been wondering if igprofithack.com is a scam or legit system to make over $3,000 in 7 days? If your answer if affirmative, you are in the right place because here I’m going to show you everything you need to know about this program. First of all, I need to congratulate you for doing your own research before getting into another money-making opportunity. You know that there are lots of scams out there, so I’m glad that you are doing your due diligence. That’s surely the way to avoid frauds and discover the legitimate way to earn passive income every day! Concerning IG Profit Hack, it’s not as awesome as portrayed in the sales page so keep reading to find all the truth about it. 2 What is IG Profit Hack about? 3 Does IG Profit Hack really work? 4 Is Insta Profit Hack a scam? 5 Get your passive income journey started! What is IG Profit Hack about? Someone sent me an email concerning the Insta Profit Hack system, so I thought I would check it out to see if there’s something good about it. If you are like me and are an active Instagram user, wouldn’t it be nice to make money from it? It surely would, right? So I started reading the information on the IG Profit Hack sales page and I couldn’t help but laugh because it’s very overhyped. I was actually surprised that there wasn’t a sales video like the other sales pages I usually land on. That was a good sign to me because it looked different from the others. However, there’s a lack of information when it comes to this product, which is a big red flag because these kind of pages tend to be fraudulent or low-quality. Anyway, what is Insta Profit Hack? 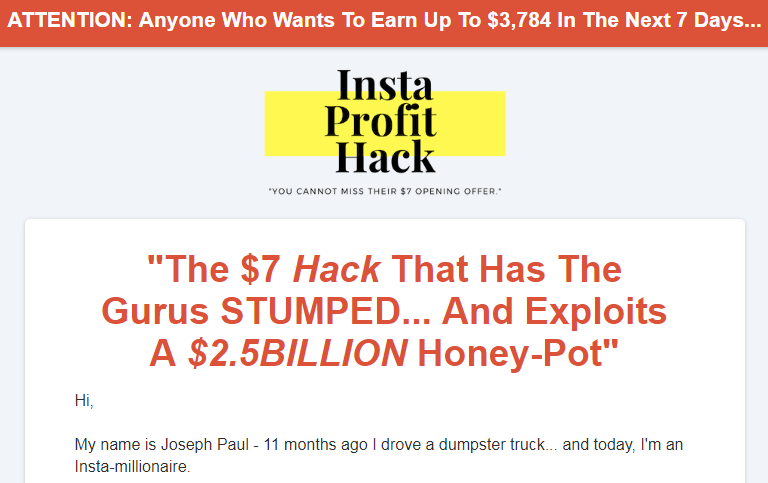 According to the man who has apparently written the sales letter, Joseph Paul, this is an Instagram hack that has turned him into a millionaire, and now he wants to reveal it to you because he wants to give back. IG Profit Hack is said to work for anyone because it doesn’t require you to have any prior experience or skills. It doesn’t even require you to have a laptop because you can use the Instagram app from your smartphone or mobile phone. This guy claims that you will be able to earn over $3,700 in the next 7 days, which sounds awesome, doesn’t it? Oh, and you only have to work 15 minutes a day to achieve these results. LOL if only making money online was that easy… I had to laugh after reading that because it sounds way too good to be true. It sounds like the typical get-rich-quick scheme. I have reviewed hundreds of programs and have realized that most of the products that promise easy or instant money are scams that only work for the people who have created them. If programs like this one actually worked, don’t you think a lot of people would have already quitted their low-paying jobs? Don’t you think there would be way less people who are struggling to make ends meet? “Joseph” is basically telling you what you would like to hear just to make a quick buck. He wants you to believe that IG Profit Hack is the solution to quickly making thousands of dollars online. Does IG Profit Hack really work? IG Profit Hack does not work as advertised. It works for the owner to profit, not for people who are looking to make money online. If you purchase it, you will get a guide on how to make money from Instagram, but only generic info. You will not get any exclusive secret or hack to earn money in no time. I have bought other products that claim to provide you with a secret system or loophole, and they end up being nothing special. Truth be told, there’s no push-button system or shortcut when it comes to making money online. The reason there are products that claim to give you some kind of a secret or hack is to make you curious and excited, so that you end up spending your hard-earned money on them. And once you are inside, you realize that they are the same as most BS money-making products out there. You see, there wouldn’t even make sense that they gave you something valuable for only $7, don’t you agree? It doesn’t matter the way you try to make an income online, any method will require you to put in the effort. When it comes to making money with Instagram, before making any money you will need to get real targeted followers. Yes, you will need to make sure that your followers are interested in whatever product or service you want to make money from. In order to get the right followers, you need to provide valuable content that can help them because people just don’t follow you for nothing. As time passes, if you consistently provide relevant content, you will be getting more and more followers. The more followers you have, the more customers, which means more money. All of this takes work, waaay more than 15 minutes a day. As you can see, making money online is a process, it certainly doesn’t happen overnight. Who’s the owner of IG Profit Hack? You would probably say Joseph Paul, wouldn’t you? That’s what it says in the sales page, but there’s no proof or way to make sure that he’s the real owner of this product. He doesn’t show any pictures of him and he doesn’t even tell us how we can get in touch with him. If he’s supposedly making that much money with Instagram, why doesn’t he mention his Instagram username? If you scroll down to the bottom of the sales page, you can read that Joseph Paul is a pen name, which means that the real owner doesn’t reveal his real identity. How can we trust someone who’s not transparent about who he is? How can we trust someone who doesn’t provide any proof that Insta Profit Hack really works? From my experience, I can say that when there are no proofs that something works, it’s because it does not work like they have told you. Like I said, IG Profit Hack only works for its owner, who probably doesn’t even make money from Instagram. He/She’s just trying to make money by selling this product. The reason con artists hide their identities is because they don’t want to get persecuted or sued by their customers. They don’t want to face the consequences of ripping people off. Another ugly truth is that the testimonial who appears at the end of the Insta Profit Hack sales page is not a real member. His name is not David Legg and he hasn’t even bought this product. The guy who appears in the picture above has nothing to do with IG Profit Hack and he might not even know that his picture has been used to create a fake success story. As you can observe, his picture appears in various websites and it’s being used for different purposes, which means that the testimonial is completely fabricated to make you believe that there’s someone who has earned money with IG Profit Hack. But there’s no way to verify that there are people who have made money, let alone $3,700 in 7 days. I personally believe that no one has succeeded with this product because if someone had succeeded, the owners wouldn’t have had to create a fake testimonial. Also, these results would make no sense because Insta Profit Hack has recently come out, so it’s still too soon for members to succeed because success takes time and effort. Want to know something that they don’t tell you in the sales page? $7 is not the only amount of money that they want to take from you. You see, it wouldn’t make any sense that they gave you something that can make you thousands of dollars for only $7. The truth is that they are trying to make Insta Profit Hack look like a valuable program so that it seems that they are giving you so much for little money. But if you end up buying it, just after making the payment, you can expect some upsells that cost hundreds of dollars. They will tell you that you need them to increase your profits or accelerate them, but this is only a trick they use to take more money from you. Have you noticed that they don’t tell you what you exactly get for $7? They are not transparent about what you are getting because they know that if you knew what’s inside, you would not pay for it. Just after seeing that they are not honest about the owner or the testimonials, I concluded I couldn’t trust Insta Profit Hack. Last but not least, they do not provide any legal pages! Not knowing how they will use the personal details you give them is not a good sign, since they could use your personal data to make money from it. Many scammers usually collect people’s information and then sell it to other companies. That’s another way they profit, even though is not ethical. Your data is not secure if you give them your email address because they will share it with third parties and they will also send you spam emails related to other low-quality/scam products. Is Insta Profit Hack a scam? On one hand, if you take into account that you get something for your money and you might learn something about making money with Instagram, then IG Profit Hack wouldn’t be a scam. On another hand, if you think of the red flags I mentioned, the false advertising and lack of information, it’s ok that you call this product a scam. In my opinion, Insta Profit Hack is not a complete scam because it’s not the kind of product that takes your money and leaves you with nothing. I would call it a scam if it was not possible to get your money back, but in this case, you can get a refund because this product is sold via ClickBank, which is a good thing. With that said, I have to confess that I have not bought it because I don’t believe it’s worth my time. I have bought lots of programs like this and I consider that I wasted my time, which I cannot get back. So I decided I’m not wasting any more time on these kind of products. In the end, you can do whatever you want, but I have to conclude that I do not recommend Insta Profit Hack. Get your passive income journey started! The bad news is that there’s no website that you can use to get instant money without doing nothing. But the good news is that you can start building your passive income business today! I’m grateful that I found a legitimate business model that has allowed me to make a 4-digit monthly passive income online, so I believe that anyone who puts in the effort and time can do this as well. This business doesn’t require you to recruit or sell the same products as everyone else. This is not an MLM or pyramid scheme. Instead, this is about writing about a topic you love and promoting other people’s products/services. You will get to enjoy the process because you will be talking about something you have a passion for, sounds cool? For example, you write an article about something that interests other people, then someone reads it and buys something that you recommend, and you get paid a commission! The concept is actually pretty simple to understand, but it still takes patience, effort, consistence and time to succeed. This is not for people who aren’t willing to learn and take action. So what about you? Will you keep wasting your time on BS products? Or will you get on the right track to build your online asset? I hope this Insta Profit Hack review has been helpful to you and you will make the best possible decision. CB Wealth review – SCAM? 5 RED FLAGS exposed here! Tube Crusher review – All SCAM SIGNS exposed here!